Just after the first posting on this blog, I received an invitation to attend a play at our local Victoria Picture Palace Theatre in Devonport, Auckland. This is itself a footnote, being the earliest custom-built cinema in the Southern hemisphere and recently saved from developers. 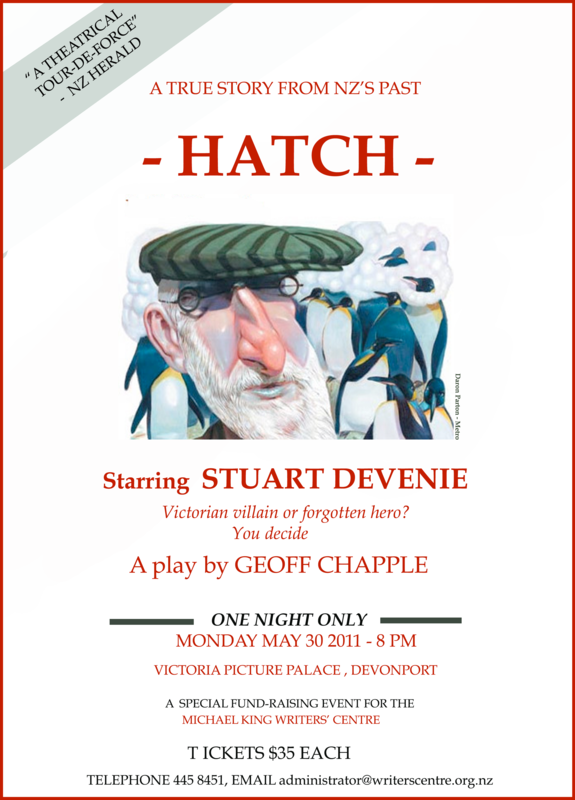 The play they were advertising is called Hatch and subtitled, Victorian Villain or Forgotten Hero. Hard to resist. A one hander, it recounts the life of Joseph Hatch, who lived from 1837 to 1928. He was a New Zealand entrepreneur and politician, but is best (well, only) remembered for harvesting penguins and elephant seals for their oil on the sub-Antarctic Macquarie Island in the late 19th and early 20th centuries. In three decades, over two million penguins were killed. He was born in London and worked in printing and perfumery before emigrating to Australia in 1856. Employed in Melbourne with a firm of wholesale druggists for five years, he was then sent to set up a branch in Dunedin in the South island of New Zealand. He subsequently ran a successful pharmacy in Invercargill and became a prominent and respectable citizen, serving as Mayor of the city and then its MP from 1884-7. His business interests proliferated and he established a bone mill and manufactured soap, candles, glycerine, sheep-dip and rabbit poison. In the 1880s, he became increasingly involved in the sea elephant oiling industry. The government of New Zealand had been restricting the seal killing season from 1873, in an effort to save them from extinction. In 1886, one of Hatch’s ships became a matter of public attention when it went to rescue shipwreck survivors in the Auckland Islands. Seal skins were found on board, and Hatch had a lot of explaining to do. At the time, he was hoping to be re-elected to Parliament, and called a public meeting to explain himself. However, for the first time in his public speaking career, he was unable to win over his audience. He lost the next election. By 1889 there were less sea elephant bulls but the Norwegians had developed a technology able to extract oil from meat and bone as well as blubber and from smaller animals like penguins. Hatch quickly realised the potential of the penguins, which included Rockhoppers, Kings, Royals and Gentoos. He was quick to take advantage of the lack of restrictions imposed by the Tasmanian Government, which administered the bleak and inhospitable Macquarie Island, halfway between New Zealand and the Antarctic Circle. Hatch’s activities were under constant scrutiny and much criticised. At a meeting in 1891, he claimed that the issue of protecting the penguins was ‘ridiculous nonsense’ because, compared to the huge numbers of penguins living there, few birds were killed. Hatch leased the Island from the Tasmanian Government in 1902, and moved to Hobart in 1912. After returning from the Australasian Antarctic Expedition (AAE) in 1914, Sir Douglas Mawson, campaigned to have Macquarie Island set aside as a nature reserve. This drew the attention of the media who focussed on the issue of cruelty to penguins. Hatch had to deny English and Australian newspaper reports that his sealers herded penguins into digesters to be boiled alive. By 1919 the concerns had developed into possibly the first-ever international campaign to preserve wildlife, with Antarctic explorers like Mawson, as well as Frank Hurley and Apsley Cherry-Garrard getting involved. They were joined by others such as H G Wells, Baron Walter Rothschild, The Times of London, and the Seamen’s Union. By now, even the Tasmanian government was losing interest (and face) and Hatch’s lease on Macquarie Inland was not renewed in 1920. Within a few years his business had collapsed, and Hatch lost his properties in Invercargill and Hobart. He died in Tasmania on 2 September 1928. The play I’m being asked to go to, I am told, will, as Hatch did in 1920, try to clear his name and justify his actions. It offers “alarming insights into the country’s record on conservation.” The subtitle of the play – Victorian Villain or Forgotten Hero – is actually a question to the audience which is asked to choose their preferred answer. In the 21st century, and particularly in New Zealand, the odds must be in favour of the former. Cumpston, J.S., 1968, Macquarie Island, Australian Antarctic Division. This entry was posted in People, Places and tagged adventurer, entrepreneur, politician. Bookmark the permalink.